I always take off work for my birthday because going in would be like adding insult to injury. 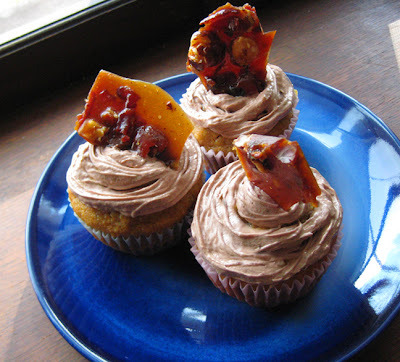 This year, with my free day-time, I decided to try out yet another cupcake recipe with the Scharffen Berger Chocolate Adventure Contest in mind. Because I like pumpkin, and we had a small amount of purée in the fridge, I thought to make pumpkin cupcakes. But of course Scharffen Berger is a chocolate company, so I had to find a way to work chocolate into the recipe. There are lots of recipes that combine those two flavors, but honestly, that's not a mix I particularly enjoy. So I challenged myself to come up with a combo that I did like. I concocted a brownie batter (with the help of my new Fat Witch Brownie Cookbook, courtesy of my brother), put a tablespoon of it in the bottom of each cupcake liner and baked it for 7 minutes until it started to set. 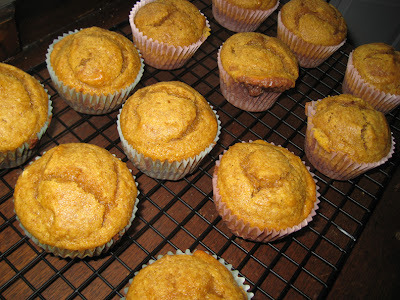 Then I topped it with the pumpkin batter and baked it an additional 25 minutes. Leftover bacon grease ended up as a substitute for some of the butter in my new favorite frosting recipe. I also added some cocoa powder and spices, to pick up similar flavors in the cupcake. 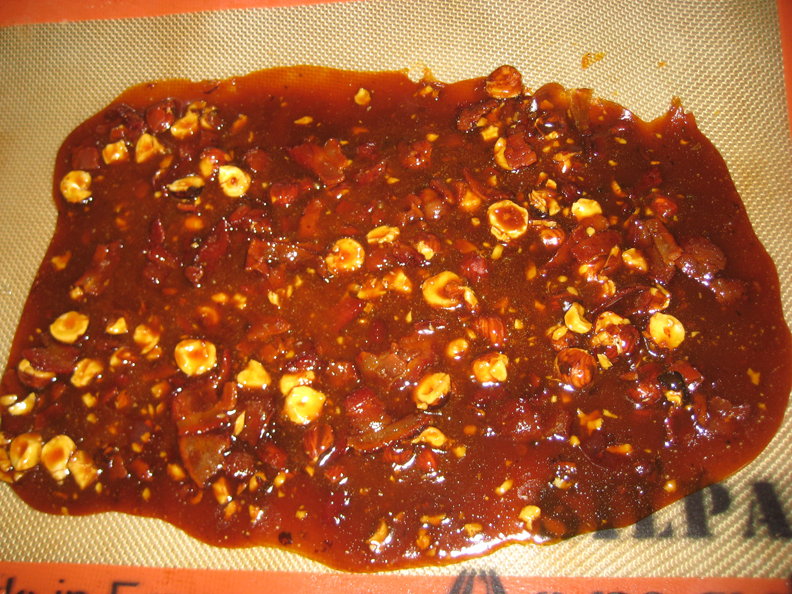 And I made a brittle with hazelnuts and bacon chunks, with the help of my new candy thermometer. Bacon hazelnut brittle. Oh yes, I said "bacon." Cupcakes, frosted, garnished, and Photoshopped. The verdict? The concoction needs a whole lot of tweaking. The brownie wasn't chocolate-y enough, and the texture was too similar to the pumpkin part. The bacon frosting also didn't deliver the chocolate flavor I needed, and I realized that the tips on my decorating set are just too damn small for cupcake icing (which I have remedied by ordering bigger tips) so the overall look was quite...sloppy. As for my first attempt at brittle? It was ok, maybe a little more burnt-tasting than I like my brittles but I think that was due to the base recipe I used. And it could have used a lot more nuts. The pumpkin part of the equation, however, was delicious - super rich and moist, nicely spicy and pumpkin-y, despite the relatively small amount of vegetable used. And the longer the cupcakes sat in the fridge (and I mean days) the better they got. Actually, the frosting got more flavorful, too. I would make them again, with a simple cinnamon-flavored buttercream. Preheat the oven to 350 degrees. Line cupcake tins with liners. In a large bowl, mix together the flour, baking powder, baking soda, salt, cinnamon, ginger, nutmeg, and cardamom. Stir in the eggs, pumpkin, ricotta, sugars, and oils. Mix until well combined. Divide batter among prepared tins and bake for 25-30 minutes, or until a toothpick inserted in a cupcake comes out clean. Cool completely. Happy belated birthday! I love that you have embraced the Emergency Marshmallow Buttercream. I love the idea of a brownie bottom and a cupcake top.